Now that I have gotten to know Outback Steakhouse from its overall story in the last post, it is also high time for me to know it down and deep from behind the kitchen. An unrequited love for a restaurant won’t be complete if you don’t familiarize yourself with the people behind it and also the kitchen. This time, the famous steakhouse took me on a trip there. It is imperative, not just for food writers, but for everyone to know what they are actually eating nowadays. The rapid development of technology brings everyone closer, brings everything which was seemingly far back then came nearer, and that includes the whole story of a restaurant. Everybody is a foodie and each share their distant past of eating out with parents or college friends, but if we look back to our past, did we really care about the trivial matter behind a good food? I believe not. Most of us would just go to our favorite restaurants, to eat what we like, and simply recommend it to somebody else if we like it so much. If not, that’s all. Now, it’s different. People are more curious about everything they eat and restaurants are opening themselves for this reality. However, Outback Steakhouse’s policy of openness is more than just that. For an intrigued writer like me, it was a chance that I should not miss when it comes to the open invitation to see what’s behind the chiller and the griddle. 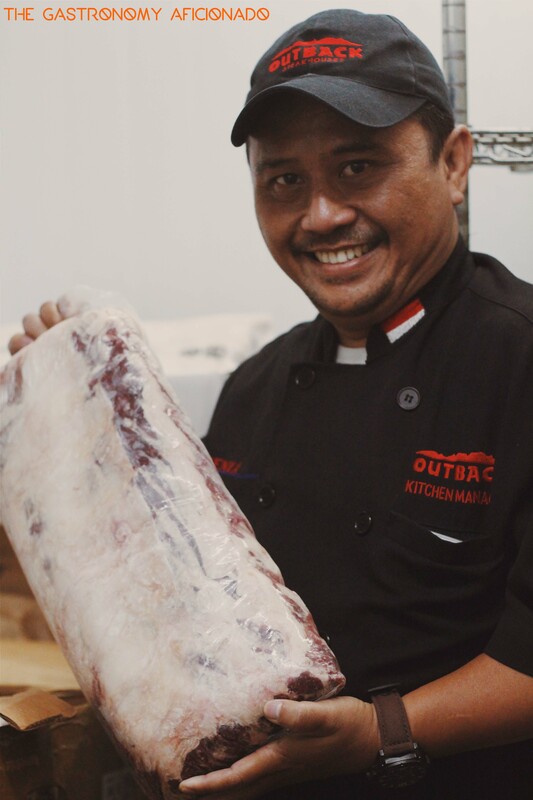 Kitchen Manager Sidik, or in other place we would call him as The Chef, took me inside Outback Steakhouse’s outlet kitchen in Pondok Indah Mall. Everything was clean and in order. It was quite spacious but well-arranged with each arrangement has a purpose in it. A good sign that this kitchen was designed for maximum utilization. KM Sidik took me to the freezer right away. It was, needless to say, chilly and windy, but I could see at once that he stacked each cut in accord to the types. Every meat available in Outback Steakhouse was USDA certified and graded as “Choice” beef. “Choice” is just one grade under “Prime” and yet it boasts tenderness, juiciness, and the flavor it possesses. It might has less marbling when compared with “Prime” but it’s a beauty, regardless what. It is quality that came in with the right price. The meat handling in Outback Steakhouse is very straightforward and designed for effectiveness. Right after they received the meat from the suppliers, they put it in right away in the freezer. Next, they will calculate how to use it best by using the restaurant’s intricate meat management in accord with the demands. Once the meat is ready to be used, they will thaw it for exactly four days in the chiller. It might be too soon for what you will call as “wet aging” but according to KM Sidik, thawing the meat in chiller temperature helps to tenderize it and that it retains much of its juice if compared to the current trend of having “dry aged” meat. 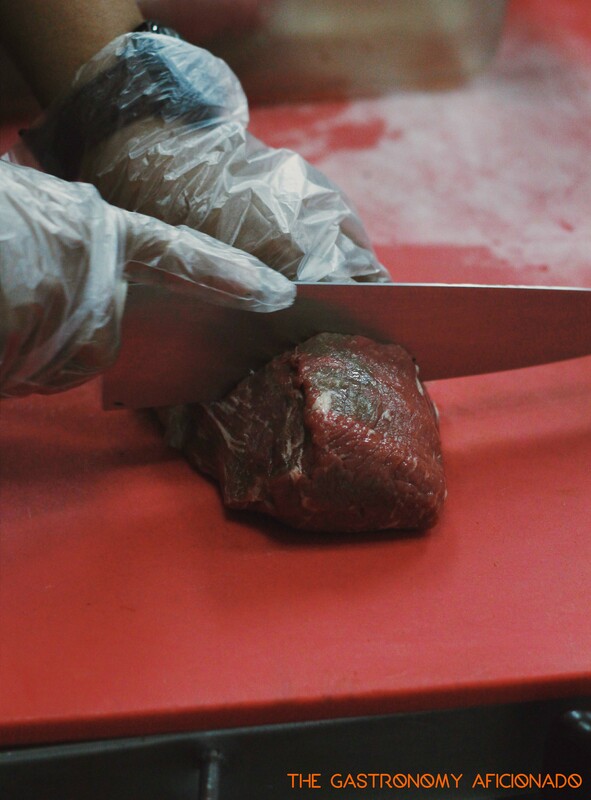 Once the time comes to serve it, Kitchen Manager is the one responsible to trim and cut the meat in assigned outlet. As the most skilled individuals in the kitchen, the Kitchen Manager is not only entrusted to trim the fat efficiently but to also perform the exact cut. 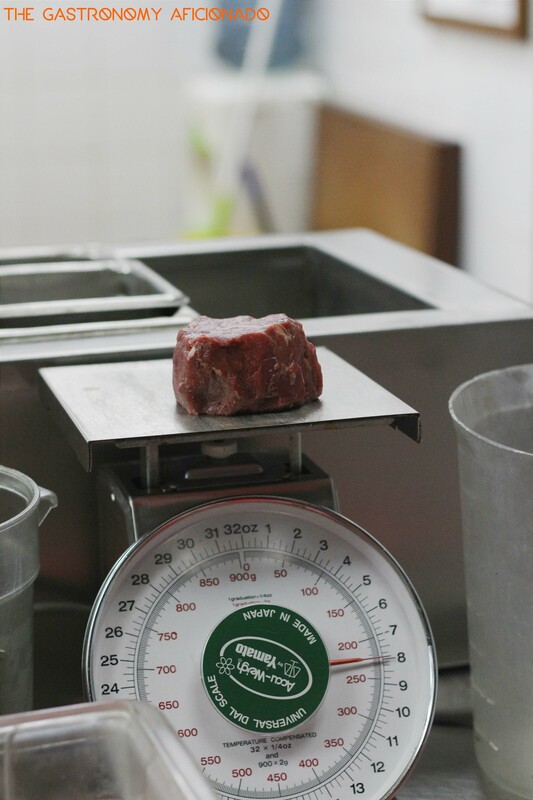 For example, KM Sidik showed me how to equally cut a large portion of sirloin (after trimmed) weighing at around 32 oz. Since Outback Steakhouse serves 8 oz of sirloins in the menu, he needs to cut it into four with balanced proportion each. If there’s even any excess, he needs to know how to trim it so that it can reach as close as possible to 8 oz. There’s a very little tolerance to reach the exact 8 oz but surely, only the experienced knows how to deal with it. For the customers, knowing this will give you peace of mind about the honesty of a restaurant as well as knowing when to treat yourself with exact calorie calculation and when to fast sometimes. At any rate, one must enjoy red meat without hesitation at least once in a while. Before we move on, KM Sidik told me a bit about the rule of thumb of grilling in Outback Steakhouse. “Usually, for loins, Outback Steakhouse would naturally do it on a flat griddle pan. It is best to do it here because the maximum amount of juice can be retained for maximum pleasure. Whereas for ribs and seafood, by default, we usually use the open grill. Customer, of course, can choose where they want the restaurant to grill. For those who like it more smoky, then the latter would be a good choice”, he explained. Additionally, KM Sidik also showed me the clear separation on the grill for the pork and the rest of the meat. Even the brush, the sauce, and everything was differentiated. From the sake of quality, even the seafood received different utensils and treatment. Once it’s time to grill. The 8 oz sirloin was sprinkled on each of its flat side with Outback Steakhouse’s secret condiments made from 17 different spices. The flat griddle was then oiled by using butter sauce and KM Sidik started to grill the beauty. 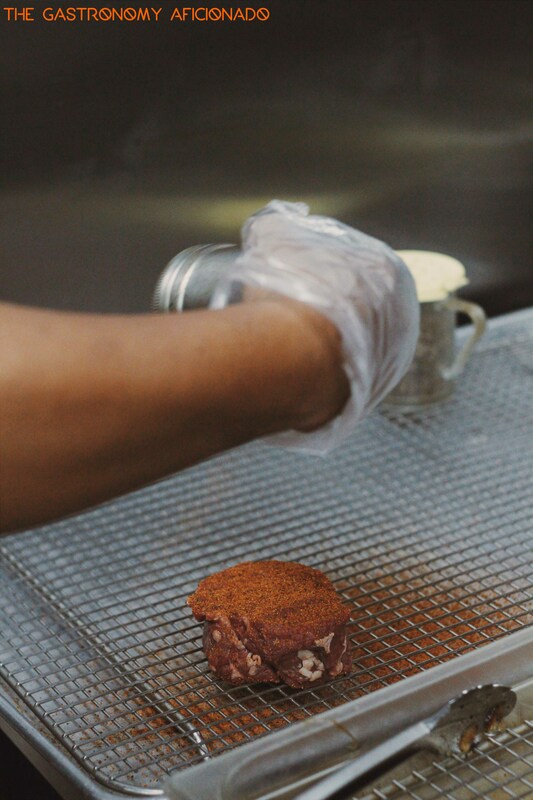 “For medium steak, I will grill each side for around 6 minutes and contrary to popular beliefs about grilling, we don’t flip the meat all the time. We flip it only when the time comes”, he continued. The griddle itself has three different zones of specific temperature. “The man who grills the meat here should know which part of the grill he has to use, which meat came in first or after, and which meat was ordered medium-rare or medium-well”, added KM Sidik. 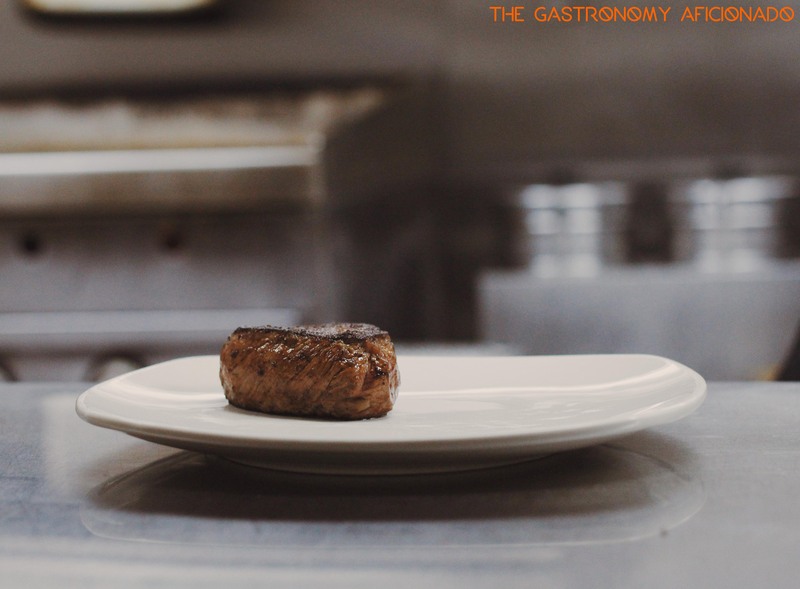 Outback Steakhouse has made it simple for the grill operator to know the right order and that way, the risk of having the meat overly grilled or other grilling problems would be minimized for the sake of customers satisfaction. Once the meat is ready, the freshly heated crunchy carrots and zucchini are also served on the warm plate. I didn’t order the potato back then since I really wanted to enjoy the meat firsthand after being grilled to perfection by KM Sidik. 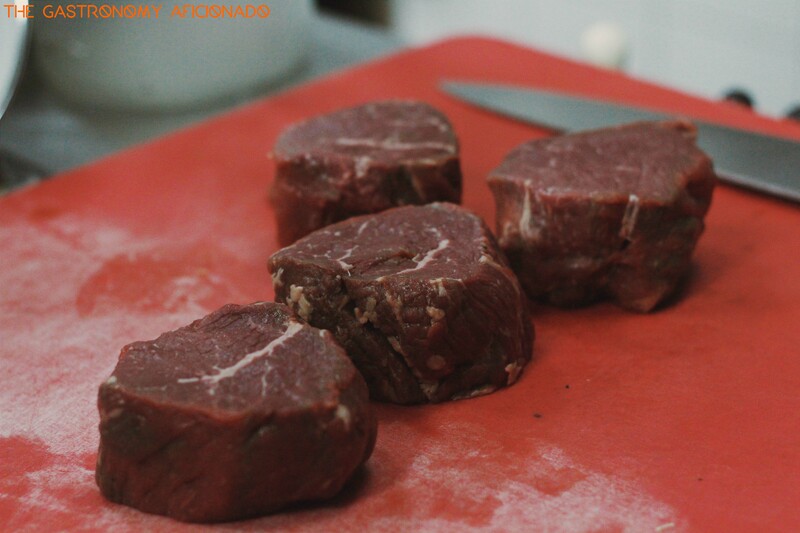 The result was an enormously delicious sirloin, ready to be savored piece by piece wholesomely with the juice inside. Seeing the right red color, it was more than I could ask. Although sometimes I like it rarer than this but it was too good to be missed. 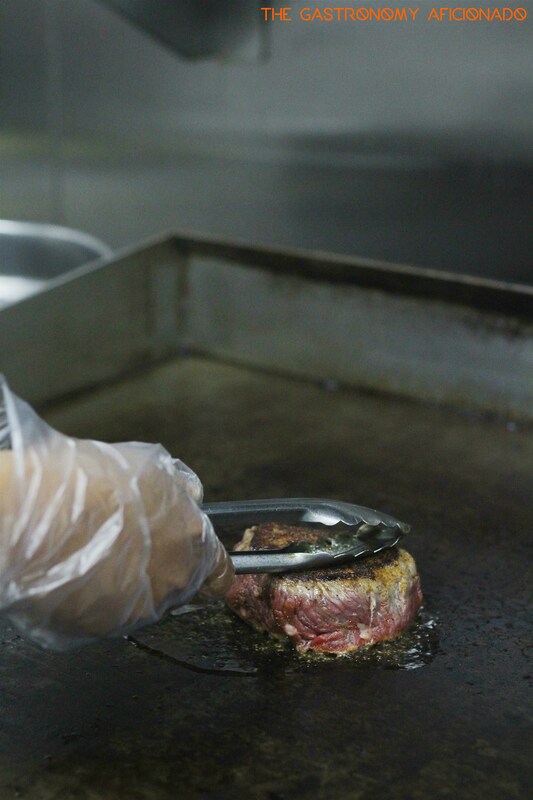 Knowing the whole flow and how they retain the quality brought me closer to the restaurant. With that kind of trust, I would not miss even a single bite from a good meat like that. If only, perhaps in the future, I can have the opportunity to also visit the farm from the meat came from, then it would complete everything that I need to know about the meat business. It’s just like what I did sometime ago with coffee by knowing it from the farm, the roaster, and also the brewer with heart. I believe the meat industry should treat the consumer with that opportunity to improve and correct each other fairly, but also to build trust with the community. Outback Steakhouse has given its responsibility to the community by its openness, even from a single small visit inside its kitchen. It’s now an open road for us to continue the good relationship far to the future and a good steak in-between from time to time. Outback Steakhouse is an American casual dining concept with more than 1,000 locations spanning in 22 countries. 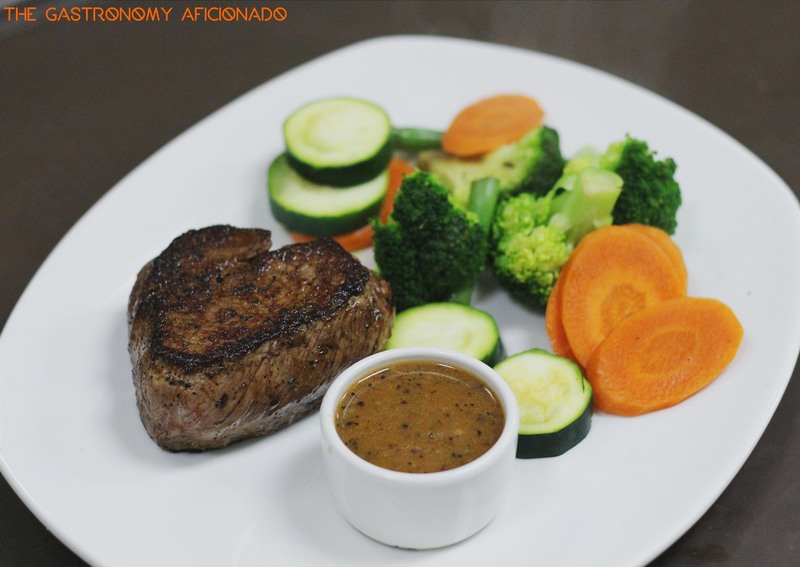 Established in Tampa, Florida in 1988, each restaurant is a friendly, casual and relaxing place embodying the spirit of the Australian Outback with flavorful food, excellent service and attentive staff. The first Outback Steakhouse in Indonesia was opened in 2001 at Ratu Plaza shopping Center, Jakarta. Fourteen years of serious food, generous portions, concentrated service and a laid back ambience have made Outback Steakhouse the restaurant of choice by many. Whilst steak and other meat items make up a good portion of the menu, the concept offers a variety of chicken, seafood and pasta dishes. Outback Steakhouse in the States was voted #1 Best Steak in the influential Zagat Survey® of National Restaurant Chains, bagging the prize four years in a row from 2009-2012.